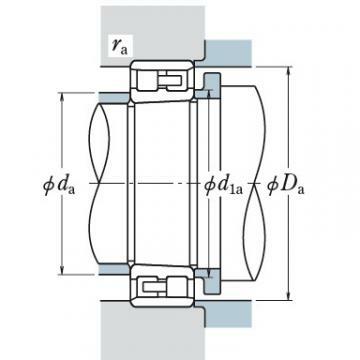 In bearings of this type, the cylindrical rollers are in linear contact with the raceways. They have a high radial load capacity and are suitable for high speeds.There are different types designated as NU, NJ, NUP, N, NF (for single-row bearings), NNU, and NN (for double-row bearings depending on the design or absence of side ribs). The outer and inner rings of all types are separable.Some cylindrical roller bearings have no ribs on either the inner or outer ring, so the rings can move axially relative to each other. These can be used as free-end bearings. Cylindrical roller bearings, in which either the inner or outer rings has two ribs and the other ring has one, are capable of taking some axial load in one direction Double-row cylindrical roller bearings have high radial rigidity and are used primarily for precision machine tools.Pressed steel or machined brass cages are generally used, but sometimes molded polyamide cages are also used.